have been away on a retail therapy attention from this morning. Anyways as the holiday season comes over the arisen here on the blog we’re getting our make up and beauty buys in before we hit the beach..
As I was in my local Boots this weekend due to Maxfactor make up was on the agenda, as my daily beloved beauty product of their smooth effect foundation had ran out. However as a part of topping up my beauty box Boots was doing one of their sales deals of ‘If you spend fifteen pounds within the Maxfactor make up counter, you get a free gift full of Maxfactor goodies’. Me being me I had to top up and spend fifteen pounds on Maxfactor. (I’m a lover of their products, however my beauty box contains from Dior to Ted Baker so rest be assured). The gift however had everything I need. I have spent the weekend trying out these products and here is what my thoughts amongst some of tips which were in the booklet regarding each product. *Tip: Sweep a neutral eyeshadow, over your lids and underneath the lower lashes. Then apply and smudge the black kohl pencil. Or you can make your eyes pop out, as you apply the kohl pencil around the bed of the lashes and smudge with a cotton bud to get the softer finish. This is one of my favourite products is my beauty box because; I can elongate my long lashes the Maxfactor Masterpiece Max Mascara. * Tip: Apply two coats of this mascara or any other mascara to your lashes. Do you love to give yourself that pamper of a time, whilst you have spare time to apply a touch of varnish to your nails? 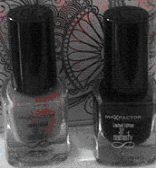 On the dark side Maxfactor’s box has a featuring of a French manicure with Maxfactor’s mini nail polish in the colours of onyx and boji. * Tip: apply the onyx on to the bed of your nails and paint the tips in the boji. It’s fashion at your finger tips! Hope you enjoy recreating these mini makeovers with your beauty products however; you can get all these products at any Maxfactor counter in any beauty department or store.